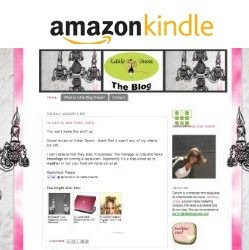 I have a new friend Rachel who is not only very sweet and dear but she is full of fun ideas to get us up and out. She hosts the Daytona chapter of Dining For Women, and she has brought a breathe of social fresh air to our little town. A couple of months ago, she had a friend in town and asked a couple of us on a random Tuesday to come meet us at one of my favorite restaurants...just to get together. 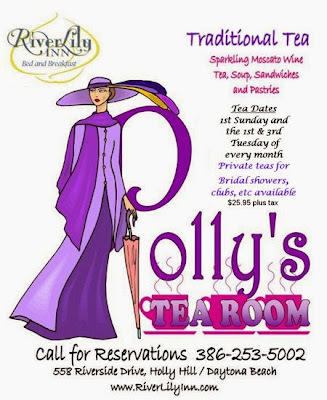 This time, she organized a group of girls to get together to Polly's Tea Room at the River Lily Inn. Its nice to pull us out of our rut and go do something different with not just the same people in attendance. I have known Polly for quite a while, and have held a bridal shower as well as a retreat at the River Lily, It was nice to see Polly and her husband Art still do so well. It was funny, I was certain that the tea crowd would be good but not wall to wall packed-there wasn't an empty seat in the house! We were served a traditional high tea, with moscato and soup and a sandwich. Not to mention the house is gorgeous and full of history! It was delicious and I highly suggest getting your girlfriends, your mom or sisters together for the occasion! Can't wait to go back!